Facebook Messenger was officially unveiled as a standalone application in 2014 after having existed as part of the entire Facebook messaging experience for quite some time. Back then, not so many people were happy with the move taken by the social networking giant as they felt the company was compelling them to move to the chat app. What happened was that Facebook disabled the messaging function from the main Facebook mobile app, thus forcing users to download and install Messenger in order to access their inbox. If anything, what the company did was migrate the entire inbox to the Facebook Messenger app. Now that more and more people have embraced this chat app, a figure that is currently standing at 900 million, the company has decided to make another bold move. Apparently, users of the mobile web platform are being warned that they will no longer be able to access their messages from the web app. Instead, all conversations will be moved to the chat app. “Your conversations are moving to Facebook Messenger,” the notice reads. If you are one of those many people who had opted to use the web application instead of the Messenger app, well, this is bad news for you. Of course, this move hasn’t been effected yet as one can easily ignore the notice and proceed with accessing your conversations via the web platform. 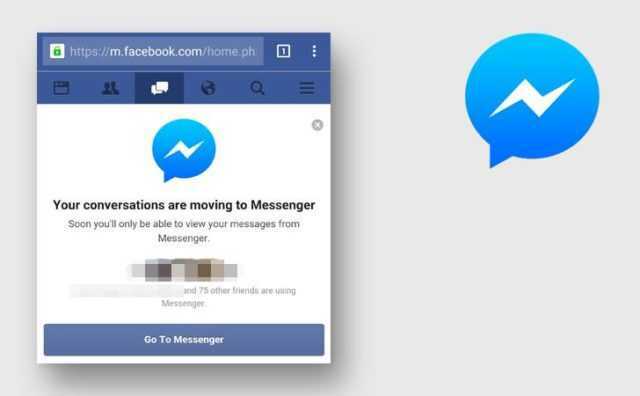 However, this will not be the case sometimes later this summer, which will leave millions with no option but to download the Facebook Messenger app. Those who use Facebook on their mobile web apps have their own reasons for doing so. Some have blamed the app for overheating phones, excessive data consumption and so on – these are the people who will see this as a very hostile move. So, while it still exists, you better make the best out of using Facebook Messenger. Previous Previous post: Moto G4 Plus vs. Galaxy J7 (2016) – Which Phone Should You Buy?